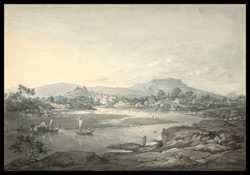 Wash drawing by Henry Salt (1780-1827) of a view of Pune in Maharashtra, with the river in the foreground, dated October 1804. This is the original drawing for 'Poonah', plate 13, of Henry Salt's 'Twenty Four Views in St. Helena, the Cape, India, Ceylon, the Red Sea, Abyssinia and Egypt'. Pune was the capital of the Marathas and the seat of the Peshwa, the head of the Maratha confederacy. On October 12th 1804 Viscount Valentia (George Annesley) met Colonel Close, the British Resident at Pune, and together they attended His Highness's Durbar. He then stayed with the Colonel in the Residence and wrote, "After the hurry of a march, and the inconvenience of a tent, I found myself most pleasantly situated under Colonel Close's hospitable roof. His gardens are on the banks of the Moota, where it joins the Moola, and forms the Mootamoola river. This runs into the Beema, which again falls into the Kistna...It is a charming spot, adorned with cypress and fruit trees."